Having returned from Venice for AcademyDay5 it seemed the talking point of the weekend was Corona a newish render engine still in development. I had seen both Bertrand Benoit and Peter Guthrie playing around in it but my interest really developed once I had seen Juraj Talcik and the work he was producing.. in particular Icelandic House, it totally blew me away. The realism and depth to his images and contrast achieved is really striking. So I decided to do a very simple conversion of my Mercato Restaurant from vray into corona, there was some necessary tweaking of certain materials to clean them up a little and a slight change to the lighting set up. In vray I had used a vray Dome light for the HDRI which isn't supported in Corona (something that I think needs be added to the corona renderer) so I loaded the HDRI into the environment map instead. The results were fantastic so similar to Vray yet so simple in comparison to use, obviously converting a scene isn't a substitute for starting from scratch but it gave me a pretty good understanding of what Corona is capable of and how easy it is to use. Above are the two images as a comparison the Vray on the left and the Corona on the right there really is very little difference between the two images. Below is an animated giff changing from the Corona Image to the Vray Image it's the easiest way to play spot the difference! I'll definitely be watching how Corona develops and I expect this will become more and more popular once it is officially released at the end of the year. Nice work the guys at Corona! What about render times ? 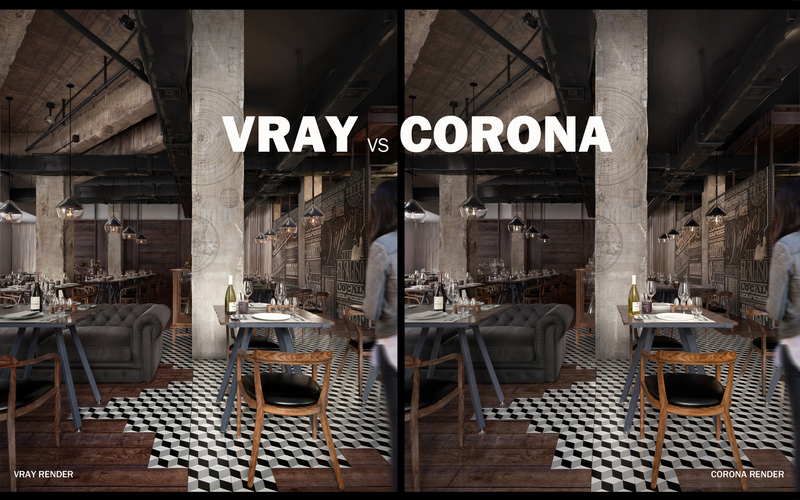 obviously Vray is the champion...quality and speed...no one can chellange Vray..
i think corona is way better. is that corona hard to usee? You post a comparision without Render time ? A u kidding ? See the link below for more info. corona render is more realistic ! You can apparently see that Vray has a better reflection and light than Corona. Remember that he/she hasn't used latest Corona version. At this point of time, Corona 1.5 is the latest official release and has the same PBR as Vray. Corona has some features that Vray lacks. For example, Resume Render and Light Mix are some exclusive features Corona has. Corona produced the more realistic render of the two. Some extra light areas and false highlights seem to give the Vray render a more HDR look - which some may find pleasing; I don't know why. However, the one that looks most like a photo is Corona in my opinion. It's hard for me to admit that as a vray user , but Corona is much bettter, there is no possible comparation.